Mandy Thompson, 40, captains the ship of her fourth grade classroom with confidence and grace. She can engage the most severe ADHD, assuage the angry with a hypnotic lesson on mindfulness, de-escalate dispute, and help the most withdrawn 9-year-old blossom like a water lily. But when it came to travel after becoming a single mother, she was perplexed. How can a single mom afford to take a vacation? 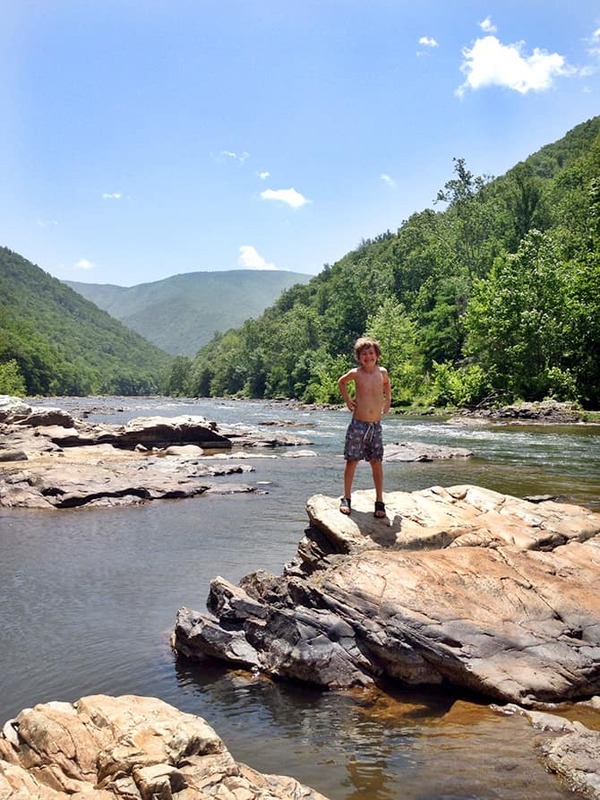 Henry spends some time at the swimming hole on the Nolichucky River in Erwin, Tennessee. To Mandy, camping is the only way to be truly immersed in nature. Her favorite campgrounds allow her and Henry to literally camp on the water’s edge surrounded by wildlife. They wake up to birds chirping and go to bed to the melody of crickets and the light from fireflies and falling stars. Mandy’s favorite camping trip begins on the Nolichucky River in Johnson City, Tennessee. The Nolichucky Gorge Campground offers open campsites for just $11.50 per adult (children 6 and under are free, 7-12 are $5) as well as cabins for those who want a little more luxury in their experience. The campsites are along the river downstream from a local swimming hole, so you can hike up to swim and then tube your way back to your tent. At a little more than five hours from Louisville, Mandy says this place is her special spot. The camaraderie at the campground, the weekly potluck, and the access to whitewater rafting and the Appalachian Trail make this her go-to choice for camping. A view of the campground in Hunting Island State Park. She ends her trip in Hunting Island, South Carolina, where she camps on the beach for several days in a non-developed state park for $35 a night. “You wake up right on the ocean, and no one else is around. I drink my coffee from my little press pot and make delicious dinners on my stove with the beautiful driftwood beach right in front of me. Driftwood Beach located in Hunting Island, South Carolina, is one of Mandy’s top camping spots. “The thing about car camping is that you can be as crafty and luxurious as you want to be. I bring a stove, a nice tablecloth, candles, a hammock, bikes, folding chairs, and playing cards, as well as a basket with all my cookware and dishes in it, ready to go. I bring plenty of blankets to make the tent cozy, and I don’t overpack because there is always a store nearby,” Mandy explains. 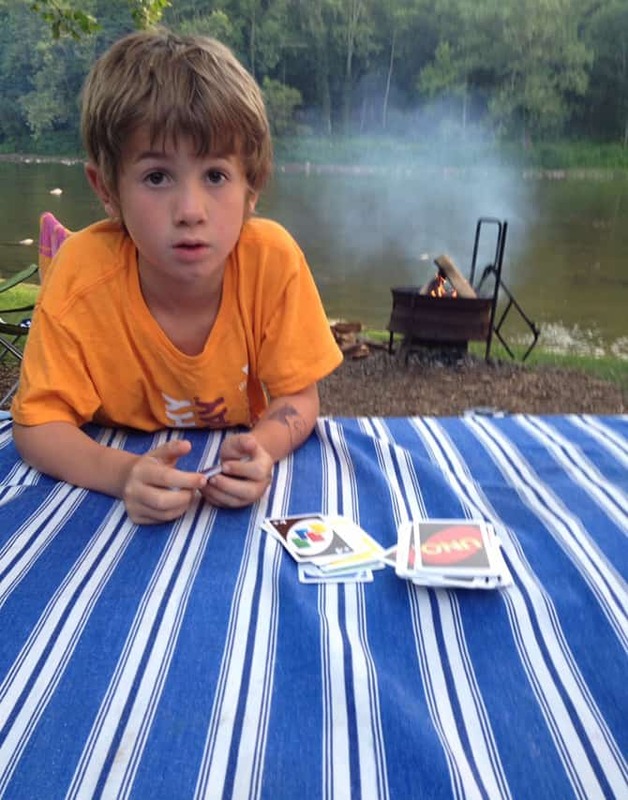 Henry can play all day in the water and make friends with other campers nearby. She says camping is convenient, easy, adventurous and affordable — the perfect scenario for this single mom. Nolichucky Gorge Campground (car camping for $11.50 per person a night or cabin rentals around $140 per night) in Johnson City, Tennessee. Hunting Island State Park (tent sites, RV sites, and cabin rentals) on a pristine, undeveloped beach off the coast of South Carolina. Mammoth Cave’s Overnight Canoe Trip on the Green River: Mandy loves this site for a quick two-day camp trip. She says there are many swimming spots, excellent back-country camping, and local attractions (not to mention the cave system). Mandy warns not to over-pack. Tent and a tarp (for rain). Basket of all necessary kitchenware and cookware. Bug spray and citronella candles. Blanket or mat for outside the tent to keep out sand and dirt. Small stove and frying pan. Pillows, blankets, an air mattress, or backpacking pads for comfort. Water and a cooler of food. Train the kids to keep the tent closed and to take their shoes off before entering. Bring a basket of art supplies, cards, books, and puzzles for the picnic table. A hammock is great for napping or as an additional seat. Keep the food locked in the car (racoons and other wildlife are crafty). Bikes also keep kids occupied. Hang a tarp over the picnic table for rain or sun coverage. Get to know your campsite neighbors — it’s a culture (and you may get invited to a potluck). Make your reservations early. Mandy starts in December. Inquire about a campsite’s daily activities for kids. This is very educational content and written well for a change.community for travelers It's nice to see that some people still understand how to write a quality post!